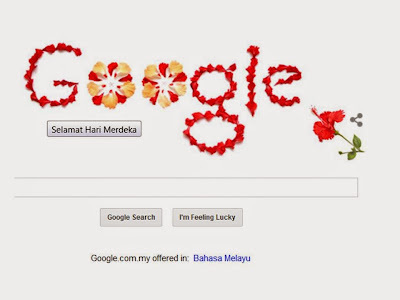 Malaysia celebrates Independence Day today, August 31, making this our 57th year of independence from Great Britain. 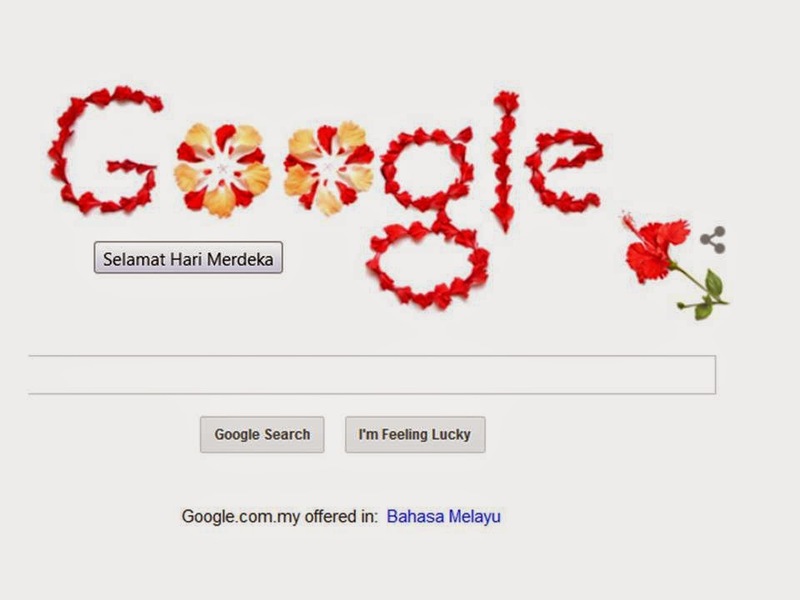 The Hibiscus flower featured on this Google Doodle is our national flower. We certainly could do with more of this plant growing in the city. I heard it needs a lot of water, maybe that's why. Here is where the country is. After the two Malaysian Airlines mishaps in a span of less than four months, I suppose everyone knows where we are now. In case you haven't heard, you can read about MH370, the plane that vanished without a trace with 239 people in it, and MH17, the plane that was hit over war-zone Ukraine killing all 298 people onboard. 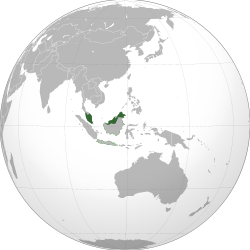 And this is the Malaysian flag. I think it'd make a great outfit. Yes? Friday Frolics - What Kind of Food Are You? Last week we took a quiz on picnic food, still on food, this week we find out the kind of food we are. Game? This Food quiz says you could fall under one of six kinds of food - Mexican, Japanese, Italian, Thai, French and Chinese. So what kind of food are you? Take the quiz to find out. Friday Frolics - What Picnic Food Are You? We have a food quiz this week, something relating to Picnic food. When's the last time you had a picnic? Take this fun quiz and see what it says about you. Today's a solemn day for Malaysia as 20 of the 43 Malaysians who perished on Malaysia Airlines MH17 on July 17, arrived at KLIA last night from Amsterdam, two more will make it home on Sunday. You are a natural leader, and you like to take charge in order to make sure things are done properly. You have a ton of self confidence, and you encourage others to aim higher. You like to do everything well. You are ambitious, but it's easy to be for you. You know that most tasks aren't as daunting as they seem. While you like to lead, you don't talk much about it. You set an example and let others notice what you are doing. What Picnic Food Are You? Last Week's What Lights Up Your Life? If you are in the US or Canada and are looking for musical instruments or musical paraphernalia, musician's friend.com is a great place to start. Besides a very wide array of guitars, keyboards, drums, etc., you can also find recording equipment, lighting, DJ-related equipment, and lots of other accessories here that will be sure to enhance your musical experience. I think they have the best prices around and the variety to suit every need. And if you are looking for used gear, you can find them here too. 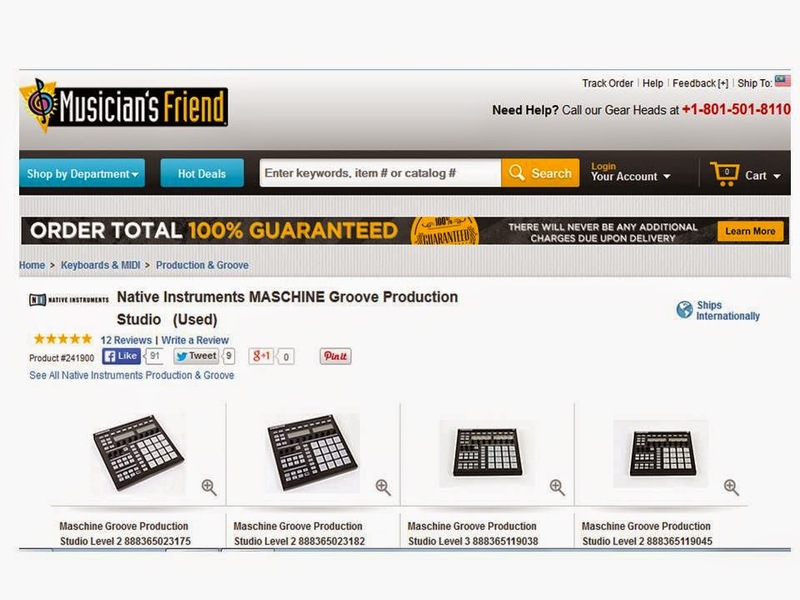 Musician's Friend receives rave reviews for their products and service, but of course, you don't have to take my word for it, you can check out their customer testimonials and see for yourself. Happy musical instrument shopping! Friday Frolics - What Lights Up Your Life? Say, have you been taking in the good vibes of this Supermoon? A Supermoon is when the moon is closest to the Earth making it apparently larger in size than at other times. In Feng Shui, the effects of the Supermoon is positive as opposed to that of an eclipse. While you are enjoying the moon, look out also for the Perseids, a prolific meteor shower associated with the comet Swift–Tuttle. The shower is visible from mid-July each year, with the peak in activity between 9 and 14 August, depending on the particular location of the stream. During the peak, the rate of meteors reaches 60 or more per hour. They can be seen all across the sky; but, because of the path of Swift-Tuttle's orbit, Perseids are primarily visible in the Northern Hemisphere. This year, the Perseids most active period is between July 17 to August 24. Look towards the North, I read. You are a self starter and self-reliant. You prefer to do things on your own and reap all the rewards. You are ready to tackle life. You are born to be the center of attention, and you're unhappy on the sidelines. You believe that things need to change in this world. And you've got the guts to make those changes happen. You are upbeat and hard charging. You have a real "can do" spirit. Have you taken last Friday's quiz? What Espresso Drink Are You? 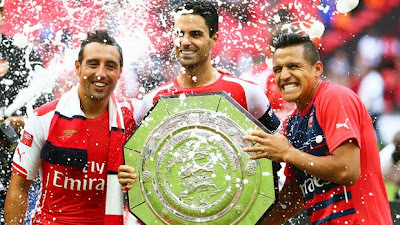 What a start for Arsenal in the new football season lifting the FA Community Shield, a win over Manchester City 3-0 at the Wembley Stadium in London. The FA Community Shield is the curtain-raiser for the English Premier league. 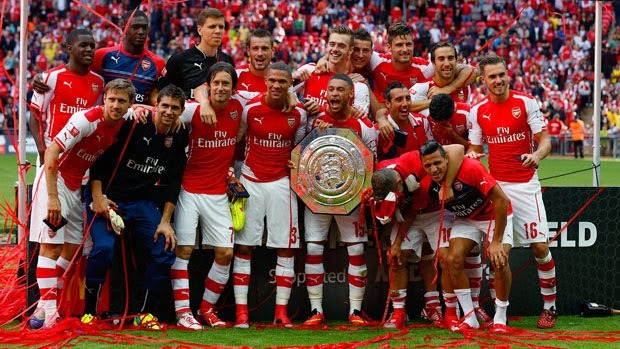 This is an annual football match between the reigning champions of the Premier League and the winners of the FA Cup. 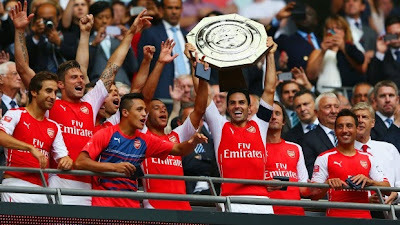 The game was played between Manchester City, champions of the 2013–14 Premier League and Arsenal, who beat Hull City in extra time to win the 2014 FA Cup Final. The match was Arsenal's 20th Community Shield appearance to Manchester City's tenth. 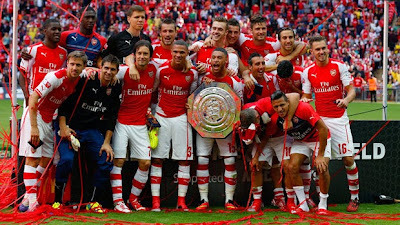 The only edition in which the two teams previously met was in 1934, which Arsenal won 4–0. Friday Frolics - What Espresso Drink Are You? Ahh coffee! If you don't drink the stuff, you don't know what you're missing. Just saying..
You are an interesting person, and people can't quite describe you to others. You are very unique. There's a part of you that is very strong and self-assured. You stand your ground, even if that means being stubborn. On the flip side, you can be dreamy, open-minded, and free-spirited. When you relax, you really take your time. You savor your life completely, no matter what mode you happen to be in. You live in the moment and make sure you are totally present. The Yin Yang Test was last week's quiz. In the Chinese community, the 7th month of the lunar calendar is one to be wary of. It is believed to be associated with the influence of more negative forces resulting in a higher incidence of accidents and deaths hence my warning about being careful in the previous post. Some Do's and Don'ts of the Ghost month for your reference.. I'm looking forward to the 8th month though... of lanterns and mooncakes. 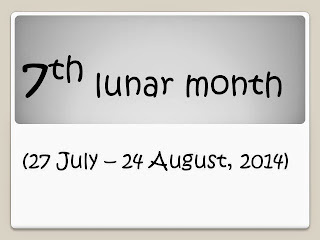 In the meantime, I leave you with what's being predicted for this 7th month..
We are in the 7th lunar month of 2014, the infamous Ghost month, which is from the 27th July to the 24th August. This month can be a rough one for the majority. Generally, there will be problems brewing, with some hideous manifestations. Individuals will form groups and some will become outcasts. Compared to other lunar months, this month will certainly see heavy sanctions on more organizations, government bodies or countries. Also, there will be more negative impact on those who work in government bodies, the public sector; even public figures will not be spared. Authoritative figures will exercise their power by making harsh decisions and executing extreme measures. Many will be intimidated while others will resort to revolt. Power shifts will be inevitable. People and material resources will be sacrificed along the way. For example, there will be major organizational changes where some will be promoted, others demoted, and still others will lose their jobs. Such phenomena will also affect politics. This lunar month will not favour finances. Some people’s income will be affected which can imply loss of jobs or business deals. For others, it will merely mean that this will not be a good time for investments. Adopt a conservative approach to finances. Keep expenses in check. There will be a lot of health and safety issues. For the majority, health will be weak. It will be important to improve your immune system. Among different illnesses, the risk of having cancer and tumour will be higher than others. There will be many different forms of freak accidents and man-made troubles like wars. This will not be a good month for traveling overseas. Try your best to reduce traveling frequency or avoid all high - risk activities. 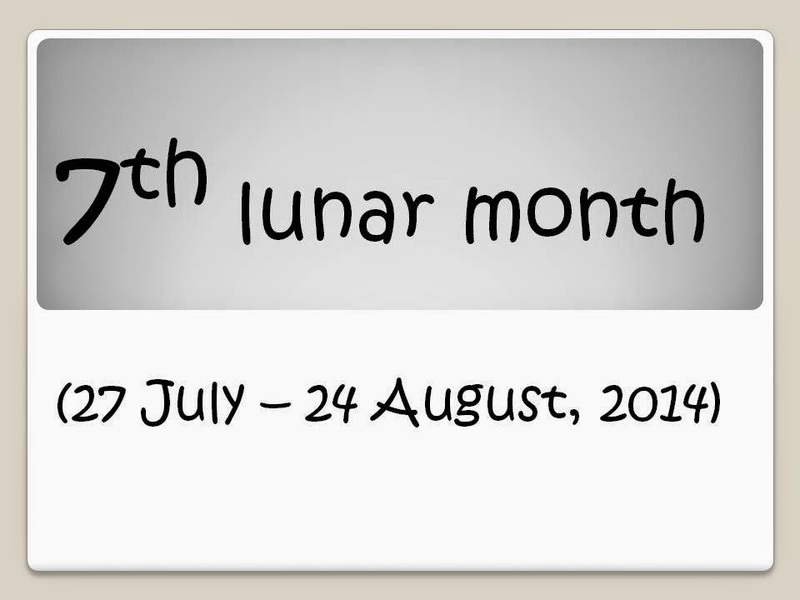 It will be best to stay alert, keep a low profile and minimize the impact this 7th lunar month can bring to you. For those who need to cleanse their crystals or have been using their crystals actively, you might want to use the moonlight of the 11th August 2014 to do so. Feel free to circulate this email to friends and relatives or anyone who is interested. It's a beautiful day outside here in Kuala Lumpur! Here's proof in the image - blue skies and white clouds frolicking above. You can even catch the glint of one of the twin towers. See it? No? Sorry, bad photo here. I've yet to say hi to the two pandas in the National Zoo; FRIM, the Forest Reserve is still on my to-visit list so are the nurseries in Sungai Buloh. I'd also like to make another trip to the KL Bird Park. Have you been there? But you must! Incidentally, I've yet to post pictures of my visit. Will do, one day. 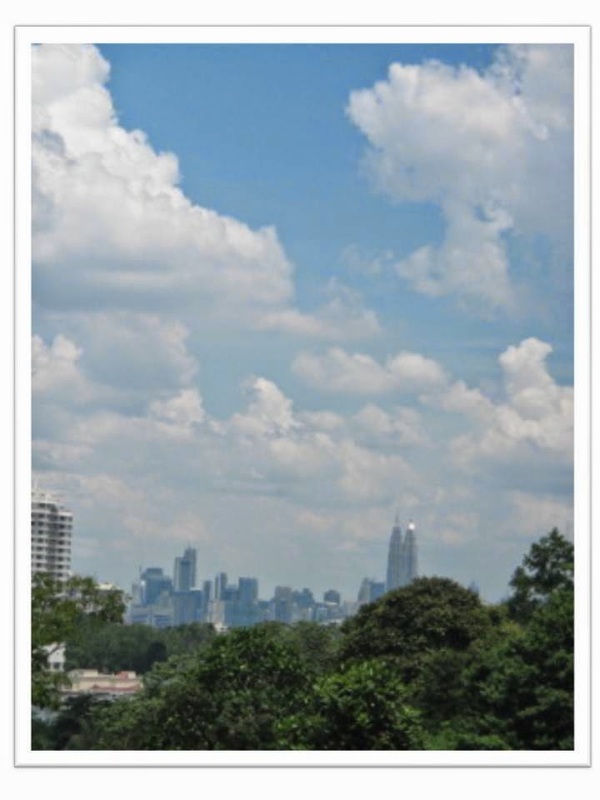 I'd like to experience going on the Hop-on, Hop-off bus tour and see KL sights like a tourist. I'd like to drop by at Central Market to pick up some postcards of KL heritage sites and more, and along the way stop by at Chinatown to check out some bead/beading shops. I read the other day of a bookshop in the vicinity with books you'd not get in a regular bookstore - and that is really worth a visit. I've always wanted to check out that Reggae Hotel that caused some stir a while back which I have written about. The list goes on.. But today is not the day, alas.. If you are in Kuala Lumpur, I hope you will have a wonderful day ahead! An umbrella won't hurt.. hey, don't scorn at the idea, it might save you some suntan lotion or even your life!? I don't know, your choice, of course, but if it rains it'll come in handy. Don't say I didn't warn you. I'm babbling, I know. It must be the sun. Btw, this is the 7th lunar month, so whatever you do out there, please do be careful. ** I'm kinda in a rush but will find some time later to link some articles. Do check back. An easy to do personality quiz this week. You have green yin. You are balanced and in tune with what you need most in life. You don't sit by passively. You enjoy uncertainty and are the first to admit that you don't have it all figured out. You embrace personal growth. You have white yang. You have a pure view of the world, and you rarely let those around you influence you. You are a bit of a blank canvas when it comes to life, and you are ready to create. You believe in new beginnings. 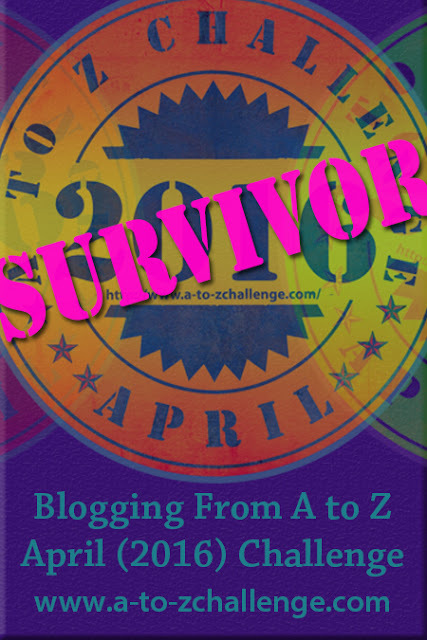 More Fun and Free Quizzes! Have you done Last Week's Quiz? What Fine Herb Are You?